The City of San Diego and Qualcomm Stadium was home to the Chargers for nearly five decades before they moved to Los Angeles after the 2016 NFL season. In 1959 the franchise was established in Los Angeles as part of the American Football League. They played one season, 1960, in Los Angeles before moving south to San Diego. From 1961 until 1966 the Chargers played at Balboa Stadium. In the early 1960s sportswriter Jack Murphy began to build support for a multipurpose stadium in San Diego for the Chargers and to attract a professional baseball team. In November 1965, a $27 million referendum passed allowing construction to began on the stadium one month later. When completed, the facility was named San Diego Stadium. QB Dan Fouts passes for 4,715 and 30 TD passes in 1980. LaDainian Tomlinson scores a team high 15 touchdowns in 2002. The Chargers played their first game at the stadium on August 20, 1967. 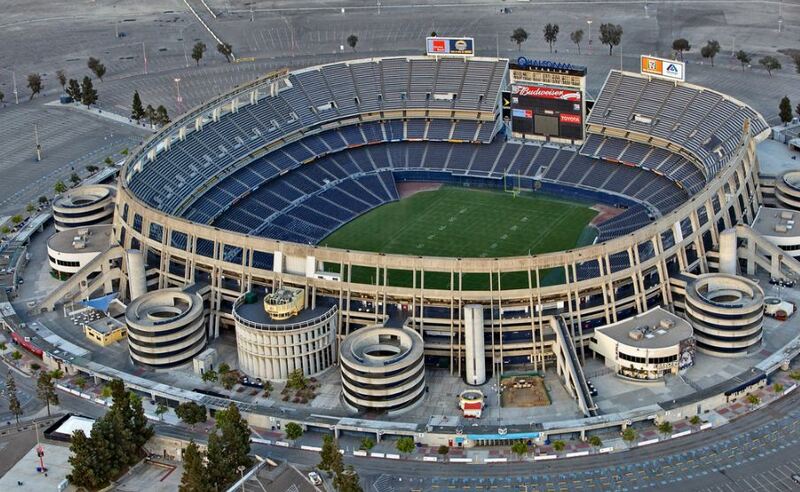 San Diego Stadium had a capacity of around 50,000 multicolored seats when it opened. The three tier grandstand was in the shape of a horseshoe, with the south end open. The team was the only tenant of the stadium until 1969, when MLB granted San Diego a franchise, the Padres. After the death of Jack Murphy in 1981, San Diego Stadium was renamed in honor of him. The stadium remained basically the same until 1983. Over 9,000 bleachers were added to the lower deck on the open end of the stadium raising the capacity of Jack Murphy Stadium to 59,022. Sixteen years later the most substantial addition was completed at Jack Murphy Stadium. In 1997, the stadium was fully enclosed, with the exception of where the scoreboard is located. Nearly 11,000 seats were added in readiness for the Super Bowl in 1998, bringing the capacity to over 71,000. Also in 1997, the facility was renamed Qualcomm Stadium after Qualcomm Corporation paid $18 million for the naming rights. All of the multicolored seats were replaced with new blue seats. 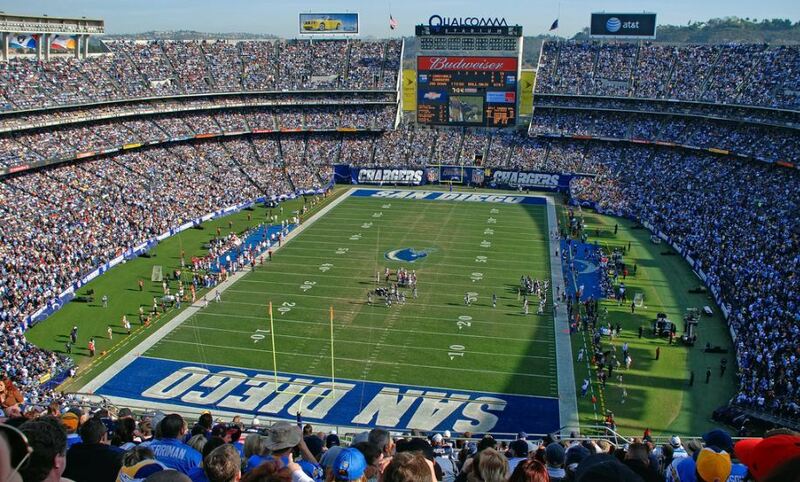 Qualcomm Stadium has several amenities including over 100 luxury suites, over 7,000 club seats, and the Charges Gold Club which is available to Chargers season ticket holders allowing service at their seats and access to air conditioned lounges. In 2004 the Chargers no longer had to share the stadium with the Padres as they moved into Petco Park in downtown San Diego. For more than a decade the Charges sought a new stadium in or around San Diego to replace Qualcomm Stadium as it was considered one of the worst stadiums in the NFL. However numerous proposals failed, including one in November 2016 when San Diego County voters rejected a referendum that would have allotted millions of tax dollars towards a new stadium for the Chargers. In January 2017 after unsuccessfully gaining support for a new stadium in San Diego, the team announced plans to move Los Angeles for the 2017 season. The Chargers become the second NFL franchise in Los Angeles, joining the Rams. For three seasons the Chargers will play at the StubHub Center while a new stadium is built for both them and the Rams. Unknown to all Charger fans at the time, the team played their last game in San Diego and Qualcomm Stadium on January 1, 2017, a loss against the Kansas City Chiefs. The long-term future of the stadium remains uncertain. It remains the home of the San Diego State Aztecs football team, two annual collegiate football games and various other events. In September 2017 the stadium was renamed SDCCU Stadium after San Diego County Credit Union bought the naming rights to the stadium for $500,000 through the end of 2018.